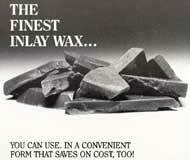 The finest inlay wax you can use, in a convenient form that saves. With Cosmetic Specialties' Inlay Wax, you'll find yourself easily achieving a delicacy of detail and smooth finish that is impossible to beat. Its bulk form is far easier to work from than the fancy packages and shapes that other waxes sport. Not only does the bulk form make it a pleasure to work with, but bulk packaging also saves on cost, making it the best buy in inlay wax today.